If you’re looking for executive functioning activities for kids who struggle with focus, working memory, self-regulation, and/or time management, you’ve come to the right place. We’re sharing 17 of our best tips and activities below, but before we get to those, let’s take a closer look at executive functioning: what is it, why is it important, and how can you help a child develop her executive functioning skills at home, in the classroom, and in therapy? Controlled by the frontal lobe of our brains, executive functioning refers to our ability to plan, organize, and manage our time effectively, concentrate on one task intently, juggle multiple tasks at once, switch our focus when needed, and make decisions based on previous experiences. Many people describe executive function as the ‘air traffic controller’ of our brains – it helps us filter, focus, prioritize, and control our impulses so we can set and achieve specific goals. Why are executive functioning skills important? I once heard someone compare executive function to instinct: it’s a set of cognitive and mental skills we develop over time that not only help us learn new things, but that also allow us to retrieve information we’ve stored away in our brains to help us anticipate consequences, make decisions, and solve problems on a daily basis. Individuals with learning disabilities and/or attention deficit/hyperactivity disorder (ADHD) often struggle with executive functioning, leading to difficulties with learning, appropriate regulation of their behavior and emotions, and challenges with socializing and maintaining relationships. What are the symptoms of executive function disorder? Is executive function disorder the same as ADHD? No. While ADHD is a common diagnosis for those with executive function disorder since many of the signs and symptoms overlap, it is possible to have executive function disorder in the absence of an ADHD diagnosis. How can I help my child build executive functions? Educate yourself. 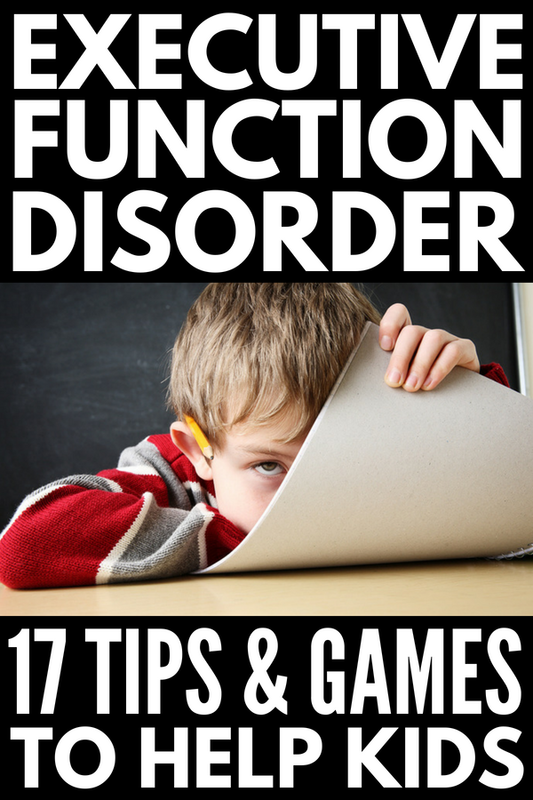 If your child has been diagnosed with executive function disorder, the first thing you want to do is educate yourself on her individual challenges. While we immediately want to find ways to ‘fix’ our child’s problems, it’s important that you fully understand the things your child struggles with before you start formulating an action plan. Does she have difficulty focusing? Is time management a challenge for her? Does she struggle with appropriate self-regulation? Has she also been diagnosed with ADHD? The more you understand her individual challenges, the more equipped you will be to find ways to support and help her. Seek help. Occupational therapy, cognitive behavioral therapy, and other psychology-based interventions can all help a child with EFD, as can hiring an after school tutor in the subjects your child is struggling with. The trick is to figure out which kind of therapist and/or intervention your child would benefit the most from, and then do your due diligence in formulating a proper support team for your child…and for you! Remember to set specific goals and engage in regular check-ins to ensure your child is progressing towards those goals, and don’t be afraid to switch to another therapist/type of therapy if you feel your child’s needs aren’t being met. Employ school supports. While the term ‘IEP’ sends most parents running for the hills, sometimes a parent has to go outside their comfort zone and do what’s right for their child, and if your little one is struggling in her school environment, this may mean working with the school board to find ways to accommodate her needs. You may also consider a Montessori school system or homeschooling your child if she needs a more ‘out-of-the-box’ approach to her education. Break down tasks. If your child struggles to perform tasks from start to finish, find ways to help her break them down into smaller, more manageable tasks. It may take longer to complete school assignments, but that’s what IEPs are designed for, and she will feel much more confident and successful in the long-term if she finds an alternate way to complete her assignments to the best of her ability. Take regular brain breaks. Also know as ‘sensory breaks’, brain breaks are designed to provide calming or active input to help a child concentrate. Whether your little one gets distracted easily, appears hyperactive, or struggles with impulse control, or appears tired, disinterested, or lost in her own world, engaging in regular brain break activities throughout the day will help her gain the sensory input needed to stay alert and focused both in the classroom and at home. Check out our favorite brain breaks HERE. Reward your child soon after the desired behavior is completed to establish a connection between the 2 and keep her motivated. Choose a reward that will motivate your child but that you can sustain over time. Additional time watching TV or playing on the iPad, an extra book at bedtime, a trip to the park after school, etc. all work well, but I encourage you against using sweets and monetary rewards as you probably won’t be able to keep those up long-term. Never take stickers away! If a sticker was earned, it is something to be proud of. Do not punish a child by discounting something she worked hard to achieve. Never reprimand if a sticker isn’t earned. Instead, spend some time reviewing the goal of the reward chart again and be sure to give reminders throughout the day to encourage success. Use visual schedules. By giving your child a visual representation of what her day will look like, you are empowering her by allowing her to look to the visual schedule and move from one activity to the next without prompting, which lessens the chance she will be caught off guard and react poorly. The Easy Daisies Grade 1-7 Classroom Schedule is one of my favorite classroom tools, which can be adapted for use in the home! If she struggles with completing school assignments on time, buy her an age-appropriate planner and get her into the habit of setting specific school goals and show her how to break them down into manageable, bite-sized tasks that feel less overwhelming. If she struggles with time management, invest in a Time Timer to help teach her the concept of time, and encourage her to work in shorter intervals with regular breaks scheduled in between to help her stay focused. If she struggles to follow directions, get her into the habit of verbally repeating the things that are asked of her to ensure she understands, or take it a step further and have her write the directions down so she can refer back to them if needed. Each of these things takes a bit more upfront work initially, but if you spend the time getting your child used to doing the things that help her remain focused and aid her in proper planning, organization, time management, and/or self-control, they will eventually became a habit to her, which will set her up for long-term success. In addition to the ideas above, there are HEAPS of fun activities to improve executive functioning in kids, and you probably already have some of these games lying around in your basement! Distraction. This game is equal parts hilarious and educational, and can be enjoyed in the classroom or as a family. Players take turns drawing number cards and must remember the growing sequence of numbers until a player pulls a ‘distraction card’. This person must then answer a silly question before reciting the sequence of numbers in the exact order they were drawn. It’s so much fun! Musical statues. I remember this being a favorite birthday party game when I was growing up, and recently learned it’s a fabulous game to teach kids the art of self-control. All you have to do is pump some good tunes, let your child dance off some energy, and periodically stop the music and yell ‘FREEZE!’ The idea is for your child to go from dancing to standing completely still in an instant, which isn’t an easy task for kids who struggle with executive functioning skills. Executive Functioning Task Cards. If you’re looking for education-based activities you can use with your students and/or children, Teachers Pay Teachers offers a whole range of excellent ideas you can buy for a minimal fee and then print off, laminate, and use over and over again. I recently found this collection of executive functioning task cards, and I highly recommend it. It includes over 160 task cards and covers things like planning, time management, working memory, self-control, organization, attention, and flexibility. You can use these to create group activities in the classroom, as a topic of conversation around the dinner table, or as journal prompts to help kids who struggle with one or more executive functioning skills. Blurt! If you Google ‘executive functioning activities for kids’, one of the FIRST things that always comes up is the game Blurt!, and for good reason. Not only is this a fun game the whole classroom (or family) can participate in, but it’s also a great way to teach kids self-control. The premise behind the game is simple – one person reads a definition, and the person to blurt out the corresponding word first wins – and when you organize the game such that only 2 people are playing against one another at a time, it forces the rest of the class/family to exercise self-control as they refrain from yelling out the answer. Brilliant, right?! Scrabble. Scrabble is a great game for kids who struggle with planning and organization. As the game progresses, they must strategize and anticipate how they can build their own words off of those already played by others. This is also a great game for kids who struggle with spelling and/or vocabulary! Memory. Also known as ‘Concentration’, there are many versions of the classic game Memory available for purchase to help develop a child’s focus and concentration skills. The idea is pretty easy and can be enjoyed with 2 or more players. Simply lie all of the tiles from the game facing downwards, and then take turns turning over 2 tiles at a time until you find a match. Children naturally build their working memory as they try to remember where specific cards are. We love our Despicable Me Memory Game, and I highly recommend Melissa & Doug’s Flip to Win Travel Memory Game as it can be played independently (or as a family) for on-the-go fun. Problems in a Jar. Mosswood Connections is one of my favorite resources for ideas to help kids with developmental delays like autism and sensory processing disorder, and I recently found this Problems in a Jar activity on their site. It’s designed to help kids with executive function disorder learn how to define a problem, generate possible solutions, evaluate and select the best solution, and then implement the solution independently. Team Sports. Another great way to help a child develop her executive functioning skills is to sign her up for team sports she enjoys, like soccer or basketball. Organized activities such as these require kids to practice a whole range of executive functions, like following directions, planning, strategizing, and even controling their emotions in the event that they lose a game. Swish. I’m new to this game, but so far I really like it. To play, you lay out your cards and then try to find as many matches as possible. The cards are transparent and have different colored hoops on them in different positions. Players must look for matches (aka ‘swishes’), and the player to find the most wins. Swishes are created when a player can line up 2 cards such that the hoops are identical when they are stacked one on top of another. Cards can be rotated in order to make a swish, requiring players to use a variety of executive functions. In addition to exercising their visual-spatial abilities, they must focus and concentrate, and work quickly to beat their opponent. I love this quote because it reminds me that our job as the parents, teachers, therapists, family members, and friends of exceptional children is to think outside the box and find ways to support them in a creative and fun way. Everyone has their own unique way of learning, and whether your child struggles in one area of her development, or has more significant challenges that impact her ability to carry out daily tasks, I hope this collection of fun executive functioning activities for kids helps compliment whatever treatment plans you have in place to help your child overcome her struggles. If you found this collection of executive functioning activities for kids helpful, please share this post on Pinterest!